A street lighting system which is triggered by passing cars and pedestrians, and a rewards app for people who scan their rubbish before throwing it away, were just two of the top entrepreneurial ideas students taking part in a popular county-wide competition came up with. 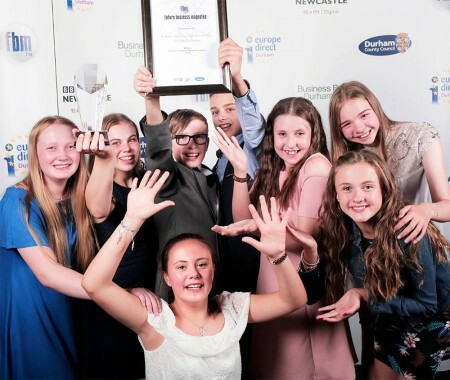 The category winners of the Future Business Magnates (FBM) competition, run by Business Durham, the economic development organisation for County Durham, were crowned at a glittering awards dinner at Newton Aycliffe’s Xcel Centre hosted by Charlie Charlton, a TV presenter and journalist with the BBC. The FBM competition, now in its 13th year, teams students up with business mentors from companies across County Durham as they come up with ideas and look at how to commercialise and market them. This year, judges were looking for a product or service on the theme of Smart County Durham. The overall prize went to St John’s School and Sixth Form College, in Bishop Auckland, for their wooden puzzle called Generation Jigsaw, aimed at connecting generations and encouraging conversations in a world saturated by technology. The judges felt it addressed an important concept and had been designed and executed brilliantly by the team. Second place went to Durham High School for Girls for their Way Ahead Lights, motion sensor street lighting, which addressed a key safety issue for rural communities in County Durham, while third place was scooped by Wellfield School, in Wingate, for their fitness box, Well Fit, aimed at showing young people how keeping fit, and eating the right foods can actually make you smarter.